considering this is the first week that it has been warm enough to ditch black tights and bring out the sandals from under my bed, I have noticed that my spring shoe selection is looking quite sad and needs some refreshing! inspired by chris’s very popular post last month, I thought it was time to discuss the 5 pairs of shoes that I need to add to my spring wardrobe. anyone who knows me is aware that I don’t take to flat shoes very well, but I feel like these madewell sandals are a great option for brunching or a walk in the park. they could easily go back to skinny pants and a breezy top or with a flirty sun dress. also, after a couple years hiatus, black shoes are back for spring and I am embracing it fully! especially, when color blocked with neutrals – black is feeling very fresh and modern for warmer weather. ok, these are completely impractical. but aren’t they pretty? we will call them “curb to cab” heels. I love zara for heels because they are cheap, and you can wear them into the ground and not feel as sad when they are scratched up. I would wear them with white denim and a t shirt for an unexpected mix of dressy/casual. paired with a gorgeous statement bag, of course. the #1 reason why I adore spring footwear: the wedge. you can go as high as you want and still be comfortable…and chic! the most fantastic combination in fashion. I wore dvf opal wedges almost everyday last summer, and plan on doing the same again this year. april showers don’t bring as many flowers here in ny as they do the need for rubber shoes. 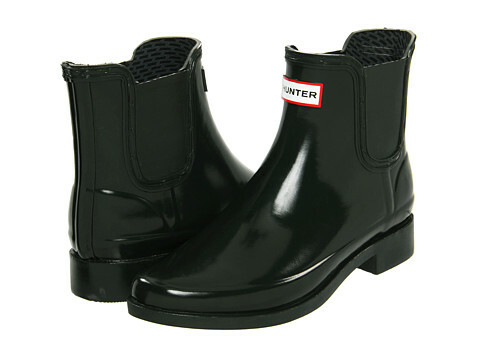 I love these hunter booties as a fresh alternative to the traditional knee high version. I am thinking to get them in either red or olive green…what do you think? let’s face it, we need more than 5…please comment and let me know what I missed. yes, B, I mean you.